The Principles of Optimal Learning Workshop examines the elements that make up a highly effective learning environment. By gaining an understanding of these, workshop participants will be able to contribute to the effective running of the classroom. This workshop introduces participants to Dr. Maria Montessori and her education philosophy. In addition, a sweeping overview of the history of pedagogical thought is given to provide context for Dr. Montessori’s system, and its place within that history. After completing the lessons, workshop participants will have a greater understanding of the Montessori method, and its unique unique and effective approach to teaching children. This workshop provides an overview of child development theories and relates them to Dr. Montessori’s educational method. Her familiarity with the theoretical material that came before her was augmented by her own insights from her observations of children. The Montessori Method incorporates this early theoretical work and anticipates some of its later findings. This attention to the science of child development is part of what makes this teaching method so effective and contributes to its on-going longevity. The Optimize Interactions with Children Workshop teaches best practices for engaging with children to create a highly effective learning environment. This workshop examines the classroom environment, including both physical and social elements, and its importance in the Montessori method. Covering topics such as the significance of arrangement, the emotional tone of the class, and aesthetic principles for order and beauty, it highlights the steps necessary to create an optimal learning environment. After completing the lessons, workshop participants will have a new found appreciation of the Montessori classroom and the attention to details that makes it work so well. 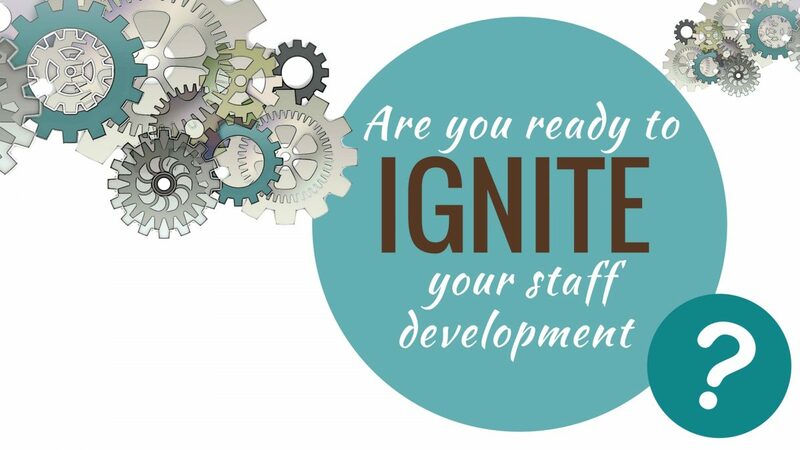 This workshop delivers a series of tips on professionalism to coach staff members in the best practices for representing and interacting with their learning community as well as next steps for their career. After completing the lessons, workshop participants will have a set of skills to help them knowledgeably and confidently engage with the whole spectrum of community members. Site License Package: With the purchase of 6 or more seats, there is an option to ADD a site license package. The site license package costs $350 and is added to the cost of the individual seats for the number of staff members taking the class. The package includes group viewing rights, bonus administrator's seat, group monitoring capability, "flex" seats, and more. For additional information about the Site License package, email us from our Contact Us page. Take your school to the next level by training your Assistants! These EXTRAS are included with the course - over $200 in added value! Commit to improving your classrooms today! This course is specially designed for support personnel in a Montessori classroom setting. It is not a substitute for lead teacher training. 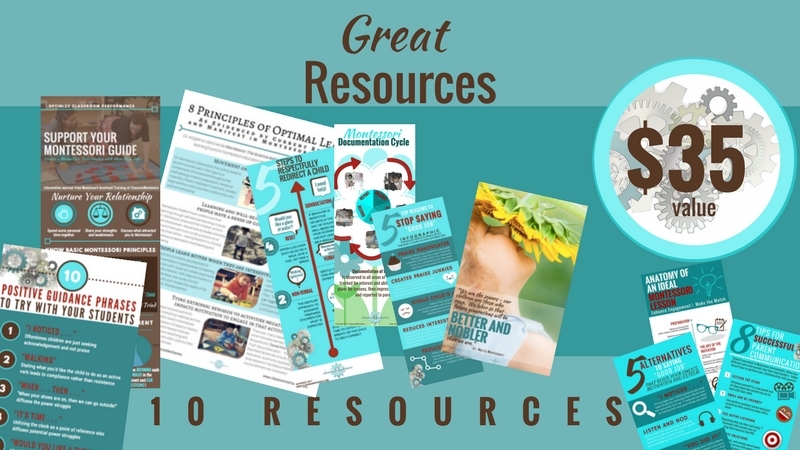 Homeschoolers may find some aspects of this course helpful, but it is primarily for professionals. 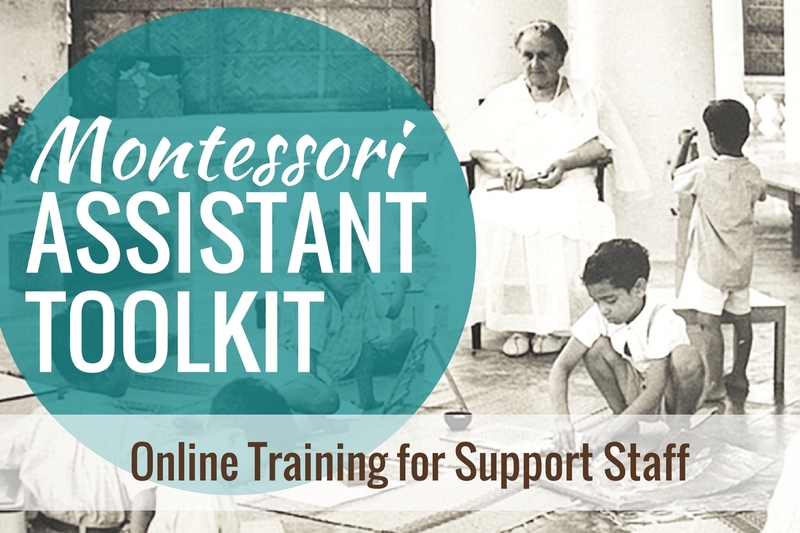 The Montessori Assistants Toolkit course consists of 7 workshops that vary in length from about 45 minutes to almost two hours, for a total of 8.5 hours of content. We estimate an additional 5-6 hours to complete the accompanying exercises in the User Manual workbook. So total, it takes about 15 hours to complete the course. We recommended taking 1 workshop per week as a way to deepen the learning and to be able to easily integrate it into people’s work schedules. Following this recommendation, it would take 7 weeks to complete the course, but only a few hours each week. This is a self-paced course. Once you sign up, you can watch the videos and complete the suggested activities at your own pace. We recommend that you allow yourself at least one week per module. After enrolling, you have unlimited access to this course for at least one year. No. This course consists of pre-recorded video lectures and recommended exercises. You may view the videos as many times as desired at your convenience for at least one year. How much access do I have to the instructor? Can I ask her questions? This course is not priced for private access to the instructor. However, Tammy Oesting will be available inside the private Facebook Group to answer questions and provide general support. Is this a MACTE accredited course? No. This is an on-demand online course and does not include the timed and in-person components required for MACTE accreditation. A certificate of attendance will be available to you once you finish the course. It will be a printable PDF certificate. Can I receive continuing education hours/credit/units (clock hours) for taking the course? If you wish to receive continuing education hours, you will need to contact the local licensing agency in your area. If you are counting on receiving continuing education credits, please consult with your licensing agency before purchasing. Each jurisdiction handles this differently, has different requirements, and uses different terminology. Below is a list of state agencies that may be able to help you determine if you can receive continuing education hours and how to do so. IMPORTANT: Some licensing agencies do NOT accept credits for online courses that are done on-demand. AGAIN, if you are counting on the credits being accepted, please consult with your licensing agency before purchasing. How do I register multiple people for the course? Multiple registrations allows a group of people to access the course with their own logins and receive certificates of attendance. Once you purchase more than one course, we will contact you within 48 hours to get the registration information for the additional course participants. (We have to do this part manually, so please be patient). They can then login and view the videos as many times as desired at their convenience. This means that you already have an account with ClassrooMechanics because you registered with us in the past. Use the password you created when you originally signed up, and then login to continue your purchase. If you have forgotten your password, click “Forgot Password” below the login button to reset your password. Please do not create multiple accounts for yourself using different emails. 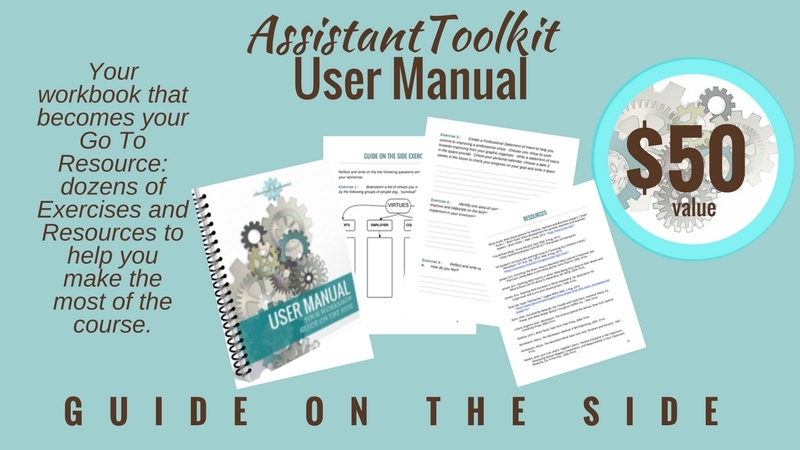 Does the lead teacher in the Assistant’s classroom need to have access to the Toolkit course content to help the Assistant? As regards the teacher’s involvement with the content of the Assistant Toolkit, there are instructions embedded in the course for the assistant to discuss various aspects of the training with the lead teacher to better understand how their school and teacher apply the Montessori method and manage the classroom. These are intended to facilitate the assistant’s seeking guidance from the lead teacher so they can be of better support in their specific classroom. 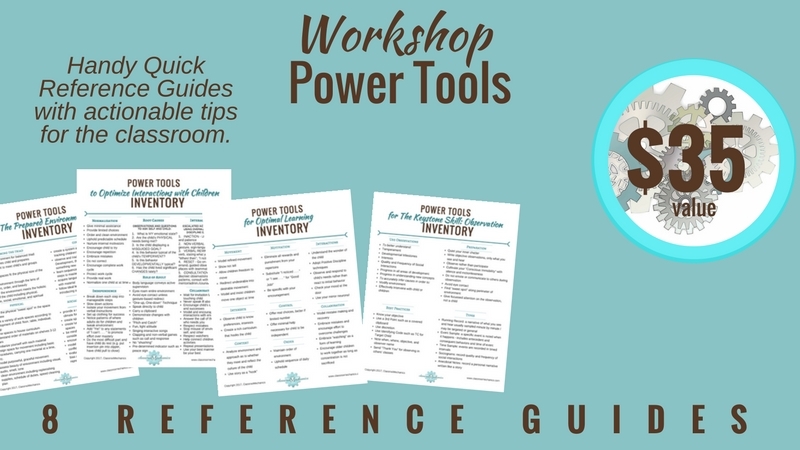 Do you have any recommendations for when lead teachers should take the Supporting Assistants Workshop that is included as a bonus with my Assistant Toolkit purchase? Regarding lead teachers and the Supporting Assistants Workshop, it is a stand-alone course and can be taken whether or not there is an assistant taking the Toolkit. 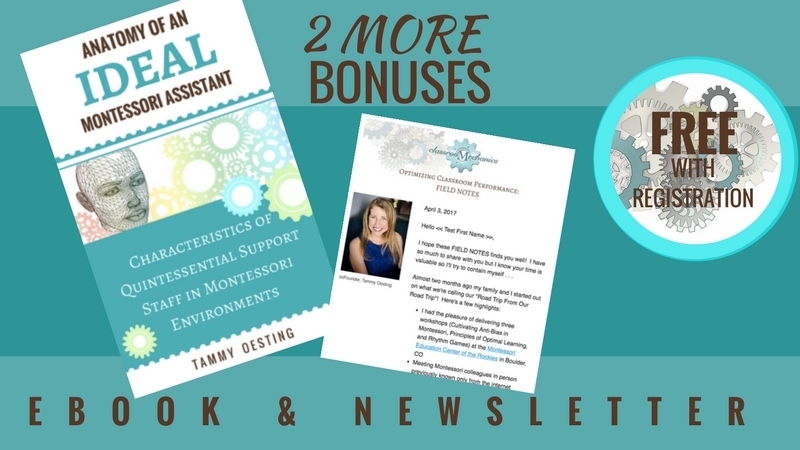 It is a collection of best practices and concepts that Tammy observed being helpful in teacher’s interactions and relationship with their assistant. If the lessons are applied, the workshop can result in better classroom dynamics and smoother operations.